A uniquely pure clay-based shampoo that goes beyond gently cleansing and giving hair a soft, gentle lift. Fortified with pure herbal actives like Soapberry, Holy Basil and Rosemary. 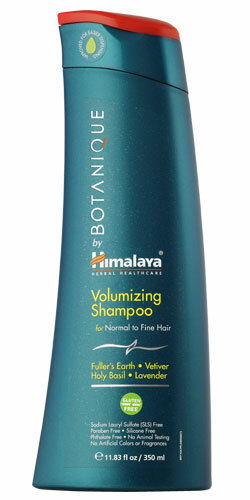 Volumizing Shampoo adds life to hair, volume, and bounce without weighing your hair down. Gluten Free, Paraben Free, Sulfate Free, Phthalate Free, and Cruelty-Free. NO artificial coloring or fragrances. Coco Glucoside (from coconut oil and sugar), Water (aqua), Decyl Glucoside (from coconut oil and sugar), Fuller's Earth (montmorillonite clay), Citric Acid (found in citrus fruits), Glucose, Potassium Sorbate, Vetiveria Zizanoides (vetiver) Extract*, Tocopherol, Benzyl Salicylate#, Benzyl Benzoate#, Origanum Majorana (sweet marjoram) Leaf Oil*, Lavandula Angustifolia (English lavender) Oil*, Eugenia Caryophyllus (clove) Bud Oil*, Cinnamomum Zeylanicum (cinnamon) Leaf Oil, Geraniol#, Glucose Oxidase, Lactoperoxidase, Rosmarinus Officinalis (rosemary) Leaf Oil**, Ocimum Sanctum (holy basil) Leaf Extract**, Eclipta Prostrata (eclipta) Extract**, Phyllanthus Emblica (amla) Fruit Extract**, Sapindus Trifoliatus (soapberry) Fruit Extract**, Cymbopogon Flexuosus (east Indian lemongrass) Oil**, Rosa Centifolia (cabbage rose) Flower Extract**, Vetiveria Zizanoides (vetiver) Root Oil*.